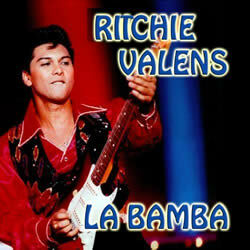 La Bamba is an Mexican Folk Song made popular by Ritchie Valens in 1958. In 1987, the band Los Lobos recorded some Ritchie Valens covers for the soundtrack of the film 'La Bamba' including the title track which starred Lou Diamond Phillips as Valens. Music: C Major in 4/4 time at 156 bpm. The version by Ritchie Valens is ~ 140 bpm. Please Note: I have included some different chord voicings for you to play around with. 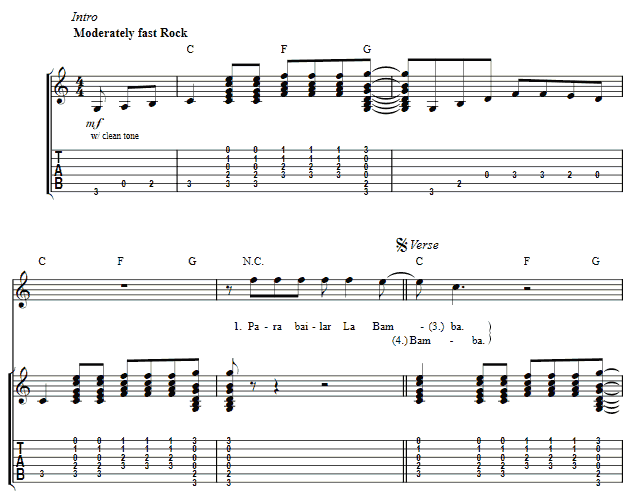 The easiest way is to use the first 3 charts (C - F - G) using the G (F-shape) voicing. This allows you to use exactly the same shape for F and G with a simple 2 fret slide between the 2 chords. If you are using electric guitar, you may want to try the barre chords. Born: Richard Steven Valenzuela on May 13, 1941 in Pacoima, California, U.S.
Died: February 3, 1959 (aged 17) in Clear Lake, Iowa, U.S. He died in a light plane crash along with Buddy Holly and J. P. "The Big Bopper" Richardson. RITCHIE VALENS chords and lyrics are property and copyright of their owners. "La Bamba" chords and lyrics are provided for educational purposes and personal use only.